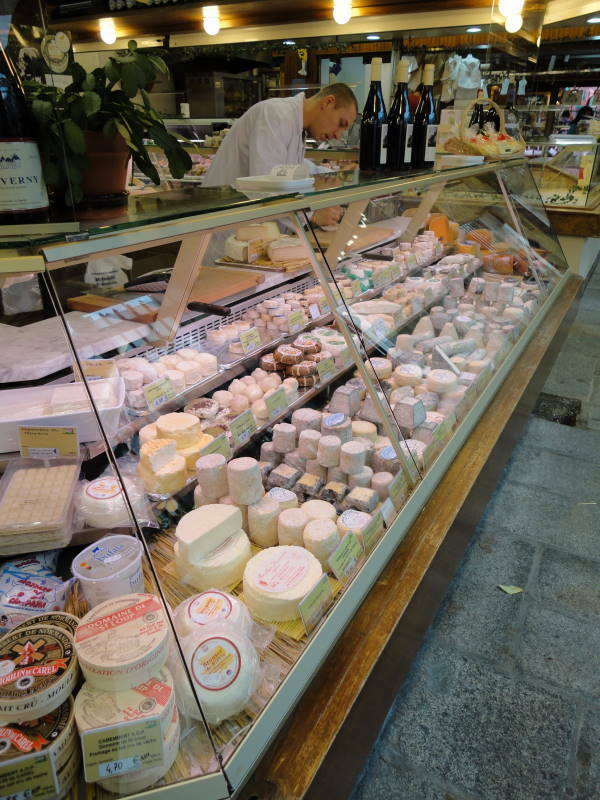 The covered Beauvau market in Paris’s 12th Arrondissement is one of the oldest in the city. It is cradled in the twin arms of the outdoor street market that runs up rue d’Aligre, from the rue de faubourg de Saint-Antione to rue Charenton; 0ne side of the street market features fresh produce and flowers , the other is a “marche des puces” or flea market featuring all sorts of second hand furnishings, clothing, kitchen equipment an a world of odds and ends. This part of the 12th, bordered by rue de faubourg Saint-Antione, is a vibrant mix of cultures, with people from North and West Africa heavily represented in the street and also behind the counters at its bars, cafes and in its market stalls. If one were to examine the butcher shops lining the storefronts behind the sidewalk market stalls, one would notice that those at the north end of rue d’Aligre are staffed by white Frenchmen while those at the south end, near rue Charenton, are by and large Halal shops with a predominantly North African owners and clientele. The produce stalls in between are easier to categorize by their utility than by the ethnic backgrounds of the salespeople. One sells exclusively potatoes, offering 15 varieties by my count. Another sells what the French consider the basic starting place of any food preparation: garlic, onions, shallots, lemon and thyme, as well as pre-portioned bouquet garni, complete with bay leaves and the outer skin of a leek. The array of produce available in the average street market in France is surprisingly large, as are the relativity low prices compared to say those at a farmer’s market in Seattle. Interestingly, while affordable, much of the fruits and vegetables offered are also organic and either from France or a close neighbor according to the handwritten signs identifying the provenance of each item. On this particular Thursday morning, as warm, heavy raindrops announced the end of a string of hot days, the market is nearly deserted and the normally harried people staffing the stands have time to talk and joke, especially as it is not yet 9am. As we are leaving Paris the next morning, I don’t have license to buy too much in the Market…a Charentais melon, some bio yaourt, (organic yogurt), a jar of confiture d’eglatine (rosehip jam), a copy of l’Equipe for the soccer news (France plays Albania in a qualification match for the 2012 Euro Cup tomorrow) and the International Herald Tribune for everything else. At the Fromagerie Langlet, inside the covered market proper, the Monsieur behind the counter was kind enough to allow a photo after I purchased my yogurt (Le Fierbois Nature from the Touraine) and a musty, well aged Saint-Marcellin, the little round disk of cow’s milk from the area around Lyon. These, in the company of a big pot of coffee and a smaller pot of hot milk, will be today’s breakfast. Tomorrow, we take the TGV to Bordeaux (allowing for the uncertainty of the French train service, the SNCF; we have heard that there might be strikes to protest lax security for train workers, in response to a recent stabbing of one a conductor. 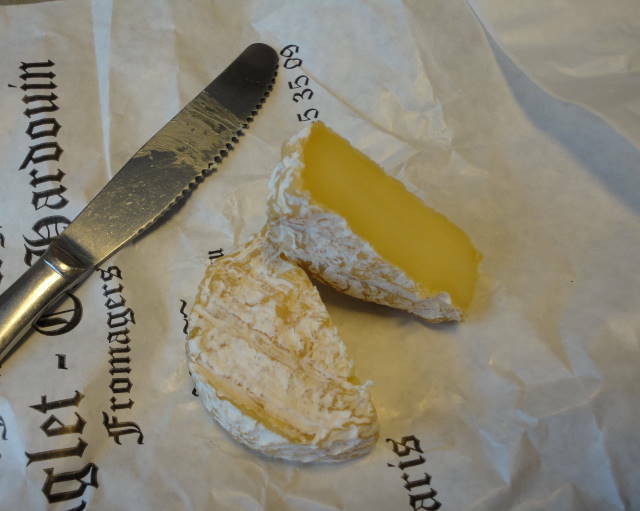 This entry was posted in France and tagged France, Fromage, markets. Bookmark the permalink. Bon voyage Jim & Sheila! Nous partons le 12 October pour Nice. 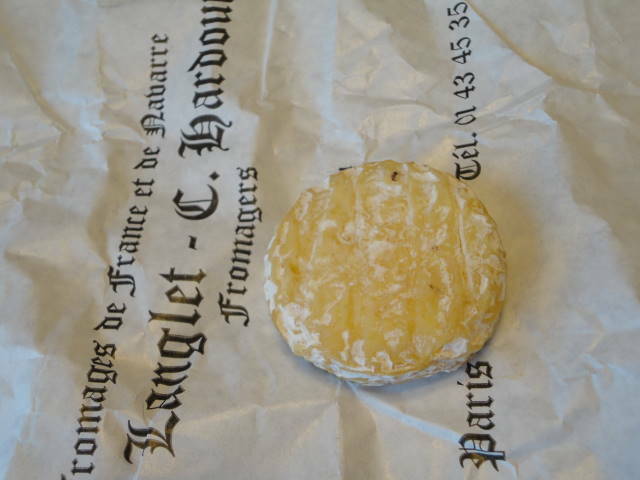 So, at the fromageries, would the monsieur not have allowed you to take his picture if you hadn’t purchased the yogurt and the musty Saint-Marcellin? I do remember one time I was taking pictures of a butcher case and the butcher wanted me to pay him something. 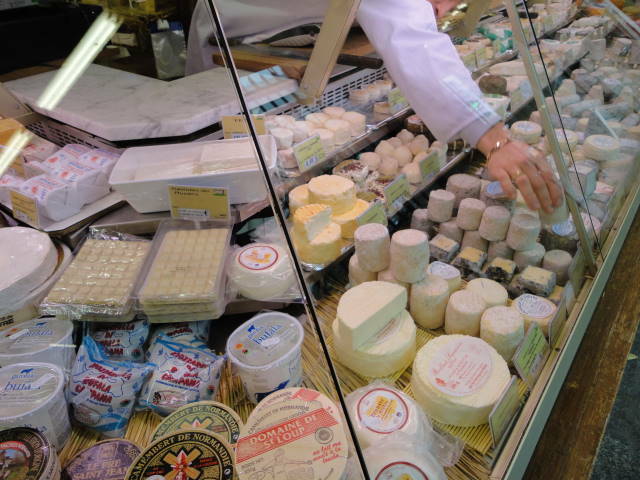 However, I’ve been in markets in Paris and other areas and they never seem to mind. I realize it would be most appropriate and polite to ask first! There just usually too much going on. When in France, I generally am over careful just to be sure I am not annoying anyone. With the French, it never hurts to be too polite. you’re getting good at this – I’ll follow your trip with smiles. Great post – the markets there are always a treat. Safe travels! My name is Annika Marklund and I’m a reporter for Sweden’s largest (print) fashion and lifestyle magazine, Sofis mode. I couldn’t find an e-mail address, so I hope it’s allright that I contact you this way! The thing is: we’re putting together a travel guide to Seattle where a local fashion personality shares her favorite shops, restaurants, clubs and so on with our readers, and she has named Café Presse the best café in town! We’d love to illustrate the guide with a photo of the café, and so I’m wondering if you might have one or a few in high resolution? If so, I’d be eternally grateful if I could have those photos in my inbox by Friday the 14th. I’ll send over a pdf of the spread as soon as the magazine is printed.